Encapsulated human embryonic stem-cell differentiated beta cell clusters (hES-βC) show promise for treating diabetics without having to chronically suppress their immune system. 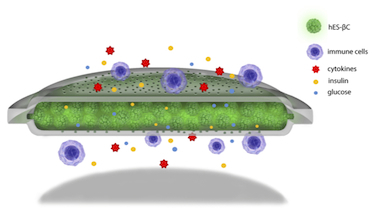 A team of researchers at the University of California at San Francisco has now made the first nanoporous polymer thin-film encapsulation device containing human stem-cell derived β-like cells that does not activate or sensitize immune cells, but which allows oxygen, nutrients, glucose and insulin to be exchanged. The device appears to work for up to six months after being transplanted in mice…..